This breakfast/brunch recipe makes 1 Benedict (2 halves) and hollandaise for 4. Creamy and super easy to make, you are going to want to put this hollandaise on everything! Raw sunflower seeds and nooch are the star ingredients. I’m going to let you in on a secret: this portabella bacon smells so amazing and tastes out of this world! Sweet and salty goodness, compassionate “bacon” – way better than the pork variety and kinder too. 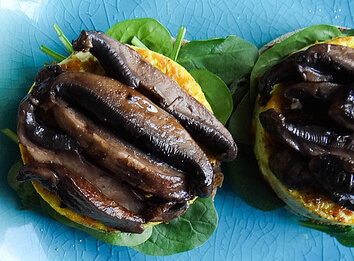 Not a fan of mushrooms? You can easily use the same seasonings with tempeh. You may need to add a little water and increase the cooking time a smidge. Serve your bene straight up with freshly cracked pepper or take it up a notch by adding a little hot sauce. Heat a small pan over medium heat – add all ingredients to pan and cook for 5 or so minutes, stirring + turning as needed (you will want the portabellas to still maintain some plumpness/moisture). Remove from pan and set aside. Wipe out the pan you used to cook the bacon. Over medium heat, add a dab of vegan butter. 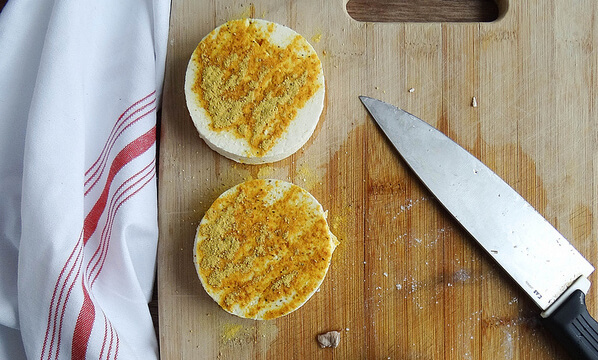 Add seasoned tofu rounds and cook until golden, flip and cook the other side in the same manner. While the tofu is cooking in the pan make the hollandaise. Place sunflower seeds, nutritional yeast + turmeric in food processor or high-powered blender. Blend until sunflowers begin to turn into a powder. With the blender // food processor running add the boiling water, lemon juice + sweetener, blend until very smooth. 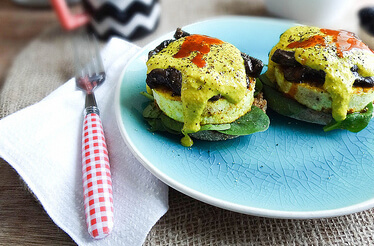 Assemble the Eggs Benedict by layering baby spinach on top of each toasted English muffin half, a slice of tofu egg, portabella bacon and finishing off with hollandaise + freshly cracked pepper, hot sauce or both!